The aim of the SMARTlab is to work across sectors and disciplines to instigate and support positive cultural change. SMARTlab insists upon an ethical and socially responsible community collaboration model, which informs and enriches the academic domain by encouraging teams of artists and cultural sector creatives to work closely across disciplinary boundaries to invent new models and tools to research, learn, and influence. This model has made real impact, since the early 1990s, helping to change the academy from within and enabling many more women, artists, open source advocates, ‘non-standard’ learners and people with disabilities (physical and/or intellectual) to gain the highest level of ‘credit’ for their practical work and scholarship, so that, once they have gained their own PhDs, they can help to shape new models of inclusive, applied practice-based research so that it can transform the university sector from within. The SMARTlab Practice-based PhD Programme has consistently graduated successful PhDs, who have gone on to lead major institutions and labs worldwide. 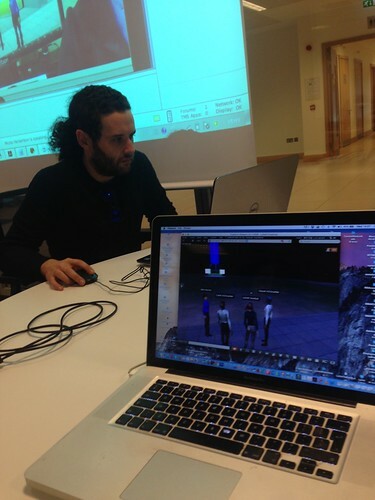 The programme currently supports a cohort of 35 international PhD candidates in the fields of Virtual Reality, Augmented Reality, Virtual Worlds, Maker Spaces/Digital Materialisation, Inclusive Design for Education, Digital Media, ICT4d, Assistive Technologies for People with Disabilities and the SMARTaging community worldwide, Technology Futures, Future Foresighting, Wearables and SMART Textiles, Performance Technologies, Assistive Tech and Innovations, Technology-enhanced Learning for Health and Well Being, Digital Inclusion, New Media and Performance, Haptic and HCI integrated studies, and ‘Meaningful Games’ or Mobile Games for Learning. The SMARTlab mission is to bring together teams of artists, scholars, technologists and policymakers who share a commitment to creative technology innovation for real social change, and to instigate impactful and sustainable projects co-designed with our communities. In our Dublin base at UCD, and at sister sites worldwide, we provide a world-class research and incubation space for academic staff, practice-based PhD students and interdisciplinary teams of artists and technologists, scholars and education experts, community workers and industry representatives, working together to create and test the efficacy of new media and informatics tools designed for a ‘universal design’ ethos. Together, we make new media tools, games, software applications, and live and telematic performances that demonstrate our model of social inclusion through the sharing of intellectual, creative and innovative capital. We are also establishing a new SMARTlab VR First Impact Lab Network, with global sites selected to support the core ethos and mission, delivered with and for a global community dedicated to making real positive social impact. Labs are equipped with the latest in Virtual Reality and Augmented Reality hardware, software and training materials, and serve as visualisation training spaces and community innovation hubs worldwide. The SMARTlab brings media artists, performers, technologists, scholars, business and e-commerce specialists, engineers, medical experts, and policymakers to sites around the world where their combined skills can make a real difference for communities, both locally and globally. The SMARTlab was founded in 1991 in its first iteration at the BBC Open University and has developed international sister sites over the years to support projects and PhDs in each location. We have gained recognition as running one of the world’s leading practice-based PhD programmes, and are viewed as an incubator for the next generation of talent and high-level scholarship in the ‘ArtSci’ and STEAM domains. The SMARTlab has run major national and international seminars, events and knowledge cafés, as well as a range of interactive think-tanks, club nights and blue-sky labs. Regular formal lecture programmes and community outreach projects are in process. Local and international organisations are invited to contact us to collaborate and participate.